Duck Dressage at Infinity Farm. My ducks are growing up and they need a hobby. Dressage seems the obvious choice. Dressage has an elite, almost aristocratic elegance that ducks appreciate. Duck Dressage has a lot going in its favor: no abusive shoeing practices for their webbies. No nasty rollkur, since a duck bill can’t actually get behind the vertical. Come to think of it, none of the other questionable training ‘aids’ work either. But I train old school- nothing but peas. Earlier this summer the herd at Infinity Farm got a new flock. (Actually a group of ducks is called a brace, but I don’t like to use that term around horses.) I complimented a friend’s Cayoga ducks. 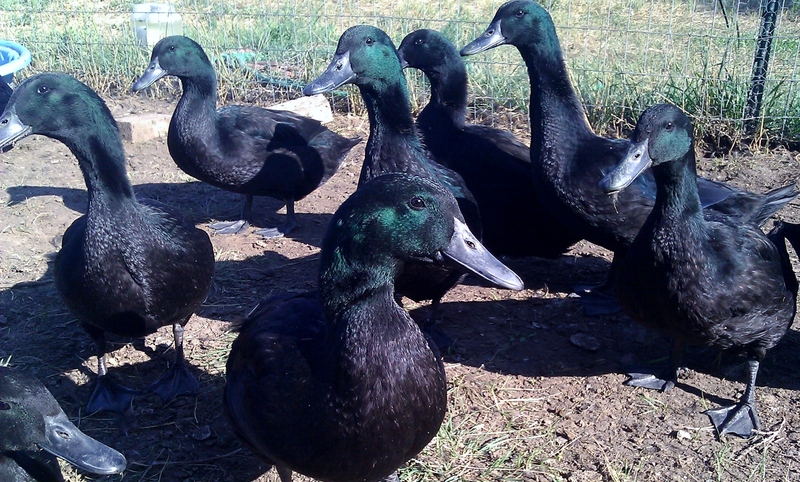 They are a beautiful black, with iridescent green, purple and blue feathers- the black opals of the duck world. 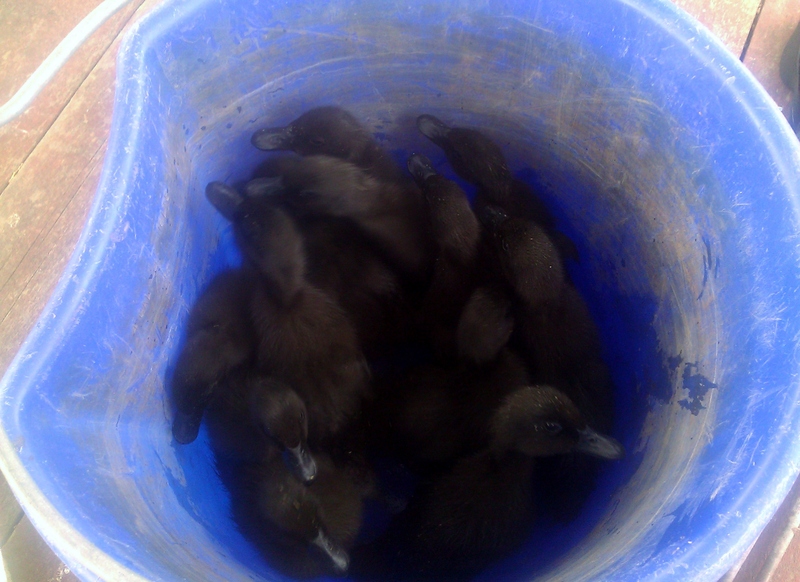 A while later, my friend called to let me know that my surprise(s) had arrived: a dozen 3 day old duckies! They were tiny, and as I loaded them one by one into a cat carrier to bring them home, they scurried to huddle in a tight ball. All except for one duck who turned his little body away from the huddle and towards me. He stared right at my face and quacked fearlessly. A tirade continued, I had time to take note. I shall call him Henri, pronounced ornery. He still speaks for the group. Later they traveled in a bucket, Henri is bottom-right. I think ducks have the same range of vision that horses have, they are just more honest about it. They turn their heads to profile and give you the one eyeball stare. Very effective. Another of the ducklings was weak, she didn’t eat well and if she got wet, she didn’t always preen her feathers dry. I nursed her through one especially hard night. I still know who she is too. She stands back when the peas come out, preferring to not dive into the fray. She knows I will distract the others, and toss her some all for herself. Maybe she is a bit slow, or maybe she is the smart one. And did you know that ducks are monogamous? Like Fred and Ethel? BIG NEWS: An international group of prominent scientists has signed The Cambridge Declaration on Consciousness in which they are proclaiming their support for the idea that animals are conscious and aware to the degree that humans are — a list of animals that includes all mammals, birds, and even the octopus. If you read the link, there are some giant words explaining that with the advent of more testing methods, scientific evidence is increasingly showing that most animals have conscious states similar to humans. It’s proof animals are sentient. Science has proved –scientifically– something that ducks, and dogs, and horses, and even a few humans have always known. We are more alike than we are different. I wonder if the real missing link is in our communication skill. I know we can do better with horses. “A, Enter working waddle. X, Halt and Quack. C, Track right and HXF- Extended Waddle!! Okay, maybe individual dressage tests would be silly. But then it came to me: Quadrille! Ducks are better suited to quadrille! It’s a sure thing, just look at their flying Canadian cousins. hilarious! makes me want a bucket-full myself! Growing up, my dad raised ducks for hobby and for his love for animals. It was a great adventure for me and my sisters. We would watch the eggs hatch, check the baby ducks everyday, watch the swim on a pond. Fun times and today, I get to relive that again. Thanks. Ducks seem to enjoy themselves, too.